Sigmund Freud: Who am I, that your friends should wish us to meet? Sherlock Holmes: Beyond the fact that you are a brilliant Jewish physician who was born in Hungary and studied for a while in Paris, and that certain radical theories of yours have alienated the respectable medical community so that you have severed your connections with various hospitals and branches of the medical fraternity, beyond this I can deduce little. You're married, with a child of... five. You enjoy Shakespeare and possess a sense of honour. I will watch, and enjoy, any movie that has Lawrence Olivier and Robert Duvall but this movie also happens to be about one of my favorite characters, Sherlock Holmes. The movie based on the Arthur Conan Doyle stories, but based on a book by Nicholas Meyer. The movie opens in 1891 and is giving the "facts" behind Holmes' disappearance for three years. 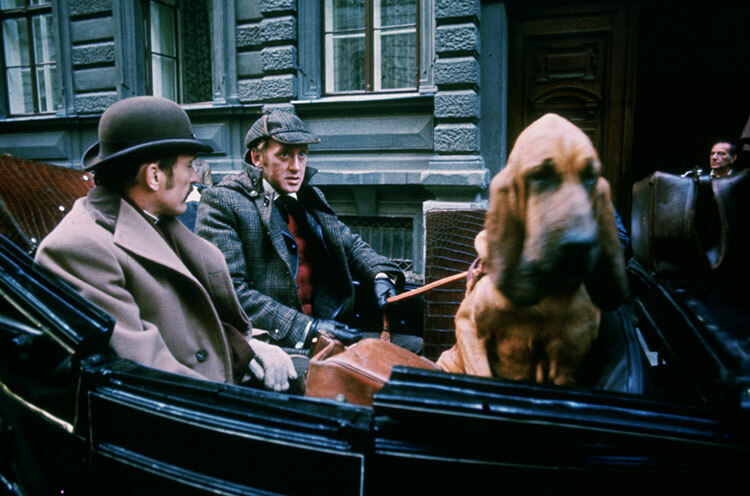 When Watson (Robert Duvall) shows up at 221B Baker Street, he hasn't seen Holmes in four months. When he gets there Holmes is ranting about Moriarty and seems to have gone over the edge. Holmes was now going to the needle for his seven-per-cent solution more often than ever. And then Moriarty shows up to talk to Watson. He explains that Holmes is persecuting him. He follows him around and sends him messages. Moriarty explains that he was both the Holmes boys math tutors. He then explains that then the "tragedy" happened, but refuses to explain it. Knowing that he has to free Holmes from his addiction, Watson solicits Mycroft's aid and he convinces Moriarty to go to Vienna. Once there, Watson arranges a meeting with Sigmund Freud. Freud tells him that he is there so he can try to help him with his addiction, which he has freed himself from. Freud hypnotizes Holmes to try to reduce the need for the cocaine. During the withdrawal Holmes suffered and had many hallucinations but eventually his fever breaks and he begins to feel better. Holmes admits that :the only time that Professor Moriarty occupied the role of my nemesis was when it took him three weeks to make clear to me the mysteries of elementary calculus." When Freud brings Watson to his athletic club, he is challenged by a Baron von Leinsdorf as a Jew, signifying that the club must have gone down hill since he was last there. He then makes reference to Freud's theories that young men sleep with their mothers. Watson then challenges the Baron, but Freud steps in to fight his own battle. But rather than duel with swords, he chooses the tennis racket as his weapon of choice and they play a tennis game in a racket ball type court. The movie does drag a little in the second half as Holmes tries to solve a mystery and Freud tries to solve the mysteries of Holmes life and in particular what event in his unconscious is driving him to use cocaine. The first mystery is a little weak, but the mystery involving Holmes' unconscious is interesting and well done. A very good movie, although not based on the original Doyle stories, it is an excellent addition to the Sherlock Holmes movie list.